This video explores Indexed Universal Life’s full range of flexibility. Whether you need to lower premiums, delay all premiums, or max fund for longer than you hoped, this video will show you how IUL behaves with a particular case study. 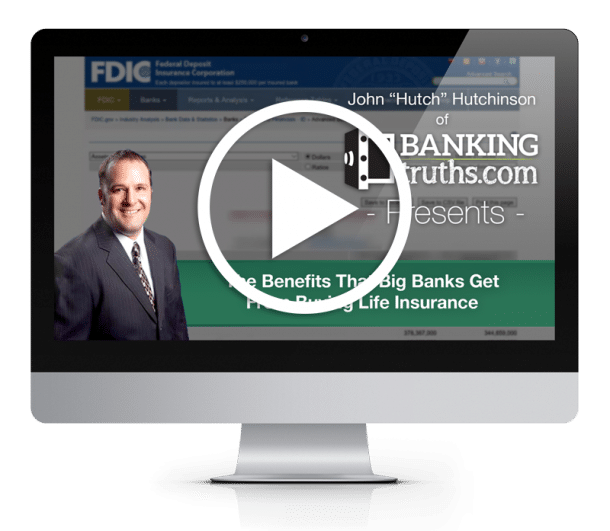 This is Hutch with BankingTruths.com and today we’re going to talk about Indexed Universal Life and specifically the flexibility of any particular policy you set up. And to do so we’re going to use this example of a male age 44 preferred health and before some of you start disqualifying yourself saying, “You know, I’m a little more chronologically advanced at age 44 or I don’t think I’m going to quite qualify for preferred health or possibly both“. One advantage you have is the IRS will let you put the same amount of premium in this case we’re showing 60000 dollars over five years. So a total of three hundred thousand dollars for the same 300000 dollar bucket they’ll actually allow you to wrap less death benefit around that premium. So conversely if you’re younger and you think you’re going to get the absolute best rating, don’t think that it’s going to be leaps and bounds better than what we’re seeing. We’re just going to have to put more death benefit around this policy. So the cost structure will be quite similar – won’t be exact but you’d be surprised how little variance you see when we create these ratios that are allowed by the IRS within the testing limits. So anyway getting back into the flexibility part, this particular scenario is optimal it’s not flexible. We might be able to fit this into four and a four and a half pay but just for round numbers, we’re spreading it out over five years. And you can see we’re using an enhanced cash value rider which actually it does diminish a little bit of the returns over time. But a lot of my clients like to see their full policy value available for loans or withdraws in case they need the money. So we are using this rider and there’s quite a bit of cash as you can see early on and growing even once you stop paying premium. So if we just move on to the next scenario, actually the same scenario but with income. So this is the exact same 60 thousand dollars five times lower death benefit increasing and then it levels off as you stop paying premiums. We can see that in this particular case we can pool sixty thousand sixty-seven thousand dollars of income 20 different times so we put 60000 in five times and we’re going to take 67 and change out 20 times and still leave some death benefit behind. And there’s a little tiny bit of cash value there we’re just really bleeding this puppy down which we don’t recommend but just for the purposes of an apples to apples illustration, we’re just using the carrier solves. Now in this particular scenario, you can see the premiums we’re putting in the same 300000. But year by year, it’s not going in quite as quickly so a lot of times people can put in the max the first year which is why they’re setting it up because they’re flush and they want to get it started but things happen and life changes. So even though you could feasibly put premium in and then borrow against the policy, especially using this enhanced cafe rider in this particular case we’re showing some flexibility in that for the next two years. You can see that only 10000 a premium is going in each year and then things stabilized a little bit and instead of the 10 you can put in 20. Not quite 60, but with this story say things if the recession has passed, real estate values are back up. Rents are coming back in. Business is picking back up and now you’re able to true up the policy in the sixth and seventh year to the FIT IN THE FULL 300000. The first thing I want you to notice is your accumulation value and surrender value along the way is still quite robust as a function of how much you’ve put in. Also once you get in the full 300000 although you’re not quite break even as soon as you get it in there as we saw with the five-year scenario, all that was available for surrender or are in their growing interest for you. This does take you know you’re almost even after the next year and certainly by the year after that you’re ahead of the game. But notice that it’s not that bad. And if we just measure it as a function of income remember before we could take 67000 and change. And in this scenario, we can’t quite take that much because you didn’t get as much money working in your policy compounding and earning interest. So you could only take 53000 20 times to solve down to a very nominal death benefit but still not too bad especially when you compare it to other asset classes with same with a similar risk profile such as bank accounts and CDs are high-grade bonds of the same quality as the carrier that issues this policy. If we look at another scenario this is extreme. While it’s quite an extreme scenario and we don’t recommend doing this because as we stated, you can actually pay premium and borrow against if you need it. But if you need it. But notice that we pay the max premium the first year and then skip the next four years. And although there is some erosion of your cash surrender value because you were supposed to put in a lot more premium and have the growth support a lot of the death benefit that the charges are going to erode a lot of these early cash values. It’s not terrible and in fact when you look at slam funding it – putting in the remaining four years of full premium over it from year 6 to 9 it catches up quite nicely if you just put 60 times all the prior numbers so 36 plus 60 91 plus 60 149 plus 60 it’s really not too bad. And when you consider after fully funding it, it only takes another two years to pull ahead of breakeven. Again it’s not terrible – we don’t recommend this scenario but in the most extreme cases could you do something like this? Sure. And if we look at again the function of income you know it’s not as good as it could be but it’s also not. It’s not terrible when you compare it to those other assets asset classes with similar risk profile. Now we’ve been talking about doom and gloom and I know a lot of my clients tend to focus on these 1 percent or 2 percent or 3 percent scenarios like oh what if the world comes to an end. But most of the time the world doesn’t come to an end or the worst case scenario doesn’t happen. They just want to see what we saw to make sure that if it does happen they’re not going to get you know like the rug is not going to get yanked out from under them or their policy is not going to just implode overnight. Let’s talk about if the good thing happens. So what happens if you want to fund this policy and you are able to fund it as planned for the first five years. And even though you wanted to know you could be done with it after five years. You wanted to see how much more you could put in there just in case things were going well. And in this case, you could put in quite a bit more premium. It looks like another three hundred and thirty thousand dollars. And the reason why these numbers are wonky odd numbers is we’ve actually put the solve on it so this is the IRS maximum we’re hitting just below the met limits on each one of these premium figures so the met test is not like a linear number it’s not like a 401k Max like the most you can put in it is 18,500 it it does vary and it varies a lot off this – the death benefit. So we’re also not even increasing the death benefit along the way. I’m going to show you another scenario where you could potentially even more, but even just keeping the death benefit flat to make the charges as nominal as possible there’s still room for extra premium in this policy. Notice too that in this last year here the death benefit goes up and that’s because the cash value has done what’s called hitting corridor. As far as this MEC Test goes there’s another test in addition to the early premium’s test often called the seven-pay test. But there’s something called the corridor test so later on as you get older if your cash value starts converging upon the death benefit you’re required to maintain a certain corridor of death benefit over and above the cash value. And it varies by age. And what happens is every year you get older the IRS lets you have a little less corridor each and every year but you just started to hit corridor and this thing is doing pretty well. And another thing that’s worth mentioning is a lot of people think that the IUL charges can be scary but just know that the charges aren’t based on the total death benefit, they’re based on what’s called the net amount at risk. That’s the difference between your total death benefit or less how much cash value is already yours. You’re already vested in it, you can surrender it. They’re not going to charge you on that number because it’s technically yours to take at any moment. So they’re only going to charge you a cost of insurance for this delta between these two figures. And if you fund the policy properly in the later years where people are worried about the charges, you can see you’re not paying for a lot of units of insurance to be that worried about. Now, in this case, the income numbers before, remember when we just paid the five premiums of sixty thousand dollars we could take 67. But when you get in these extra monies over the remaining 15 years you can take quite a bit more income from this policy. So put in more, get more, is what I say. And on that note in this particular scenario, we’re showing paying a straight 60000 every year for 20 years. And if you do that you’ve put in one point two million and in order to support this we need to have the death benefit increasing the entire time. And so you can see that it is doing just that. But you’re building up a nice big cash value number and a death benefit. And if we see what kind of income we can take off that scenario it’s actually quite a bit more so instead of 67, right? If you pay in 60 for 20 years you can take 224000. Not to mention leave more death benefit behind all on the way. So hopefully this helps you understand the full range of flexibility available to you inside indexed universal life. If you want to see your own numbers, go to the link below and you can schedule a custom call with us and we can run your numbers according to which carriers are going to play nicest with your situation and we can see about what yours will look like. Hope to talk to you soon.